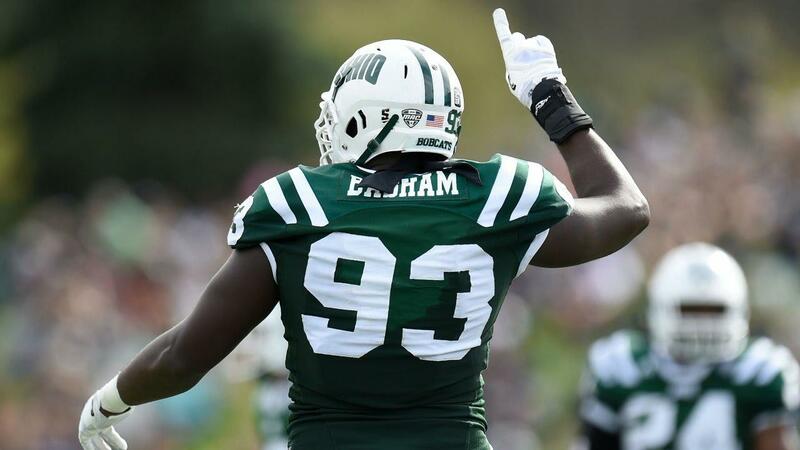 An incredibly productive edge rusher for Ohio University, defensive end Tarell Basham possesses many of the tools scouts look for when drafting a day two pass rusher. In 2016, Basham was named the Mid-American Conference’s Defensive Player of the Year, finishing his final college campaign with 16 tackles for loss and 11.5 sacks. The 6’4″ 269 pound defensive end already has a few suitors from the NFL, and some pre-draft meetings lined up with teams. Let’s take a look at the film, and assess where Tarell Basham fits in this year’s EDGE class. First things first, Tarell Basham looks the part of an NFL edge rusher. With broad shoulders, long arms, and a well proportioned frame, Basham already has a professional football-ready build. At his best, Basham is a dynamic edge rusher with a quick first step, powerful rip move, and strong, active hands. Possessing an explosive burst off the snap and the ability to jar-back offensive linemen with his powerful strike, Basham flashes a high ceiling when it comes to rushing the passer. Something I look for when scouting defensive linemen is their effort level. Things such as hand usage and rushing technique can be taught by a good defensive line coach at the next level, but when a player looks as if he doesn’t care or gives up on plays, then he will immediately drop on my draft board. Basham’s effort is never in question on tape. Against Tennessee here we see Tarell Basham work and win with a quick-twitched inside counter move. After setting up the left tackle with speed rushes on previous downs, Basham comes with a nice stab inside to keep the offensive lineman off balance. The ability to win with this inside counter is important to his transition to the NFL, but it was something else on this play which peaked my interest. Basham gets held on the play, and dragged down from behind. After being held it would have been easy to simply look to the referee for a call and stop on the play, but instead, Basham immediately hops on and still chases down the quarterback for the sack. Working well off stunts, Basham does a good job of powering through offensive linemen, splitting double teams, and shows the ability to convert speed to power when pass rushing. Against the run, Basham shows adequate block/play awareness, and is strong enough to fight pressure with pressure and defeat reach blocks to re-gain the edge. Tarell Basham clearly has the upper body strength and traits to set the edge at the next level. When he puts it all together, it is a pretty thing to see. Here we see Basham embarrass the left tackle with a quick swim inside. Once again, when he is at his best, he shows the active, strong hands to win both against the run and pass. Tarell Basham needs to improve on his pass rushing repertoire if he is going to be successful as a rusher at the next level. While he has a powerful rip move, solid inside counter move, and the burst to win with speed, he is far too raw with his hand usage and bend to expect some double digit sack season out of him at this point. As mentioned, Basham is inconsistent with his hand use. He is violent and quick off the ball at best, but is too often not at his best. I would like to see him bend more around the edge, and would also like to see him loosen up his hips in pass rush. Basham sometimes tries to bull himself through tackles too often, failing to utilize his length and hand strength to it’s fullest advantage. Simply put, I like defensive end Tarell Basham a lot. He is currently ranked as the 63rd best prospect in this year’s draft by CBSSports, putting him at the late day two, early day three range. Personally, I have a third round grade on Basham, and would expect someone to get a reliable defensive end on the middle of day two this year. Right now, Tarell Basham would be a solid contributor as a backup defensive end, rotating in on certain downs and possessions. With time, he could elevate himself to become a starting caliber defensive end.